Upgrading Instructions for eoStar, the workstations, and Mobile Devices are found below. Upgrades are available when new releases are made public. 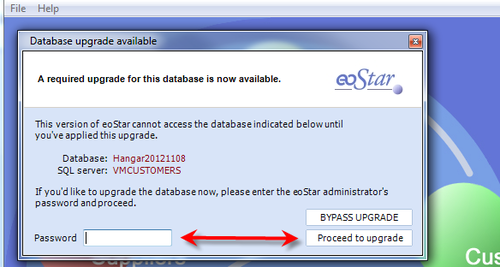 To upgrade eoStar, follow the instructions below. For a list of items no longer supported by Rutherford and Associates, see Discontinued Support. 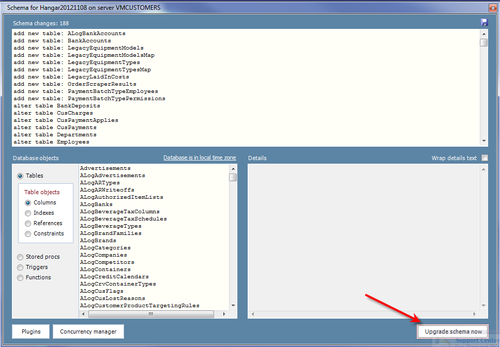 In the General pane, click Add in the lower portion of the window. Be sure to remove any entries with the Remove feature if applicable. Specify a backup name and destination (usually cannot be directly into the C:folder, must include .bak in the file name). Right-click the database folder under the server and select Tasks->Restore->Database. 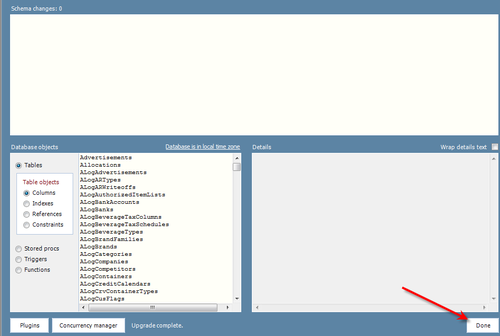 Specify database name that eoStar will look for under the To Database field (what the DB was named on the old server). Select From Device and specify the .bak file to be restored from. 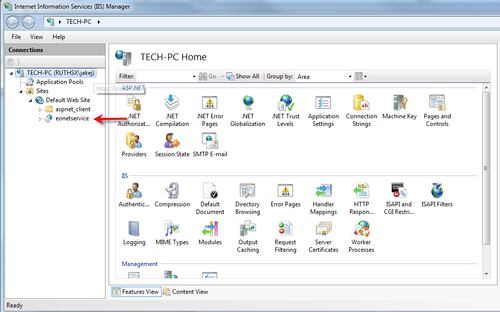 Once the .bak file is specified, switch to the Options pane in the top-left of the window. Ensure that all files listed in the grid have a different filename ending (usually it's _1 through _4, with one file being numberless. Click OK (from the General pane of the Restore window). If your company uses WMS or VoCollect you will need to upgrade those servers as well with the appropriate eonetservice and Scheduler files. Open IIS on the server that controls communication with the handhelds and expand the tree to see eonetservice as shown below. 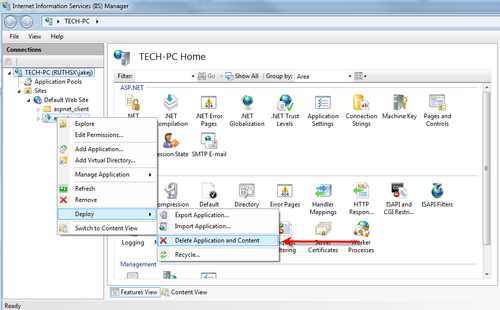 Right-click eonetservice and choose Deploy and then Delete Application and Content. 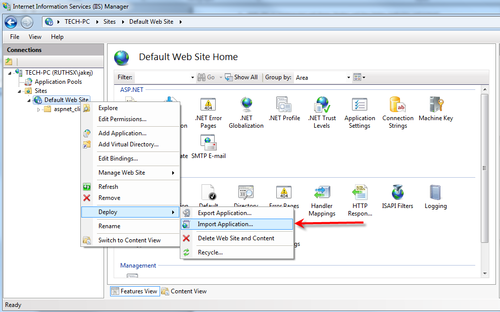 Right-click Default Web Site and choose Deploy and then Import Application. Browse for the eonetservice zip file. 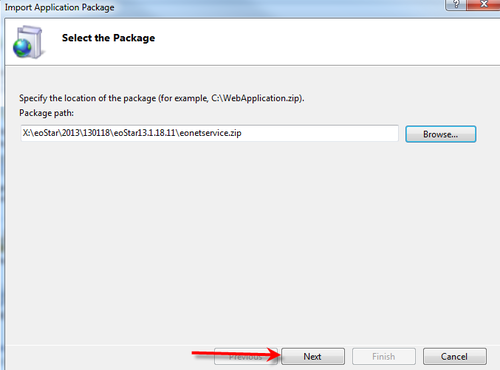 Click Next and then pick the defaults to install eonetservice. If applicable, uninstall the last version of eoStar. Either go to '''https://eosupport.ruthsx.com/sites/CustomerSupport/###YourCompanyName###/default.aspx''' or download from the FTP site. To setup an FTP connection to Rutherford, see Connecting to the Rutherford FTP. Install the new eoStar package from the supplied folder. Save a copy to your network to make upgrading your workstations easier. Select Run and follow the setup prompts, choosing the default options. Once the server has been upgraded, log into the database to upgrade it. This can be performed on the 'test' or 'live' databases at your discretion. As of July 2016, Rutherford will be performing a check to determine whether a database is a live or not. If the database is identified as live, then an upgrade code will be required to upgrade the database. All customers who are upgrading must have a valid upgrade code for the day they are upgrading. Without the code, they will be unable to proceed. Go to File > Database Administration > Cache Folder. This will open the Cache Folder. In the Cache Folder, delete Plusoption.Cache and RecordInfo.Cache. Close the folder. Open and log in to eoStar. Go to Records > Product > Records and search for a product to rebuild the cache. Repeat Steps 8-13 after you upgrade eonetservice, eoStar, and Scheduler for every server that you have. Go to File > Database Administration > Configure > Coke panel. Enter your unique ISSCOM code. If you do not know your ISSCOM code, contact your account manager at Rutherford and Associates. After a version is assigned, it becomes available on the handheld through an Upgrade. 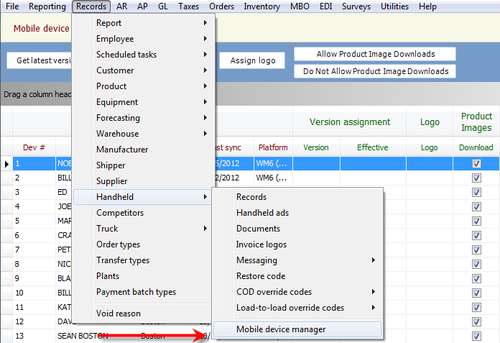 For a tutorial video on this subject, see Mobile Device Manager Tutorial Video - Assigning Handheld Versions. Additionally, due to a new version of printer drivers, some mobile printers must be setup once again when upgrading eoMobile. Go to Records > Handheld > Mobile Device Manager. Click Get Latest Version Information to obtain the latest version published by Rutherford. Select the handheld records and click Assign Version. Highlight and select the version off the version options list. You can then select the day it will push to the mobile device. 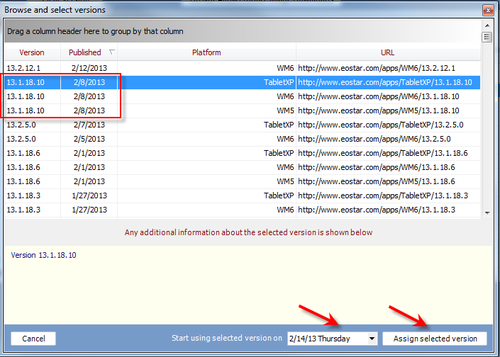 Click Assign Selected Version. Click "Post New Assignments" when finished. When the user of the mobile device full syncs, they will see a link on their display that they will touch to upgrade to the new version. Note: After the Q2 upgrade has been completed, the user will need to reconfigure the printer settings on the handheld, choosing a specific printer rather than a general manufacturer. After you've completed the update for your core system, please be sure that you updated any servers set up specifically for VoCollect or WMS devices. You'll need to deploy eonetservice the same as you did for your handheld devices and make sure that the new scheduler is installed. Note: After the scheduler is installed, please make sure that you have a working config file in the folder, then proceed to windows services and make sure that the VoCollect service is running and set to automatic start. As of January 2016: Scheduler, Vocollect, and other services are set to manual by default when you install scheduler, you will likely want to change the desired services to be automatic. Each individual workstation will need to be upgraded to the newest version of eoStar as well. 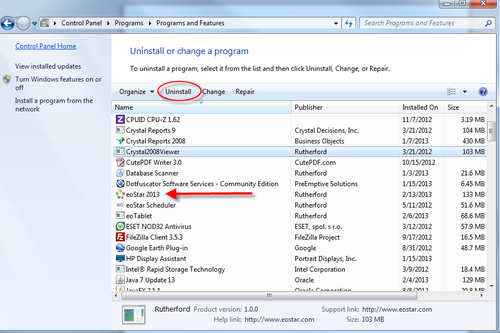 In the computer's control panel Add or Remove Programs functionality, find eoStar and uninstall it. Install eoStar from where you saved it on your network. If the eoTouch app is open on the device (iPad, iPhone) that you would like to upgrade, close the app by double tapping the home button and swiping the eoTouch app up. Uninstall eoTouch on the Device by pressing and holding the eoTouch app icon until it starts to wiggle. Once it begins to wiggle, tap the X in the upper left corner. You will receive a pop up confirming that you would like to delete the app. Tap Delete. You will receive a link for the eoTouch upgrade via email. Open the email on the device that you would like to upgrade. This page was last modified on 13 June 2016, at 12:48.